The National Cotton Council held its annual Producer Information Exchange (PIE) this past week. This program gives an opportunity for cotton growers around the nation to visit other regions within the United States to see how production agriculture works. Attending this year’s trip were growers from Georgia, Alabama, and Virginia. The trip is sponsored by Bayer Crop Science, and the attendees are guided through California by Mike Brueggemann from the National Cotton Council. The tour was kicked off with a visit to the California Cotton Ginners and Growers Association office, with an industry update from President/CEO Roger Isom. 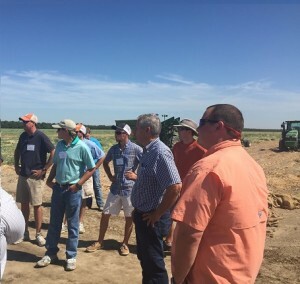 The tour included site visits to Terra Nova Ranches with Don Cameron, a tour of Gilkey Enterprises with Kirk Gilkey and other Corcoran-area growers, as well as site visits to Kirschemann Farms, and Ingomar Packing. The group was also able to stop and see some experimental work being conducted by UC Davis Cooperative Extension at the Fresno Facility. The PIE Tour has been an integral part of displaying California’s effectiveness in growing a wide variety of crops. Many of the participants this year were surprised to hear of the diversification that many area growers have on the west coast. We look forward to providing future tours and regulatory and legislative updates to fellow Cotton growers. This entry was posted in NEWS & ISSUES on July 23, 2015 by ccgga.